Our advice? Let the piggybank pile on a few more pounds before you smash its porcelain head in. This is well worth an extra few quid over an entry-level alternative. Sitka spruce works wonders for the tone. Very few drawbacks for this money. Many of us kicked off our playing careers on a sub-£100 acoustic-shaped thing. It looked like a guitar and maybe even sounded reasonably guitar-like when you hit the strings. What we didn't realise, thanks to our youthful inexperience, was an important, ear-pleasing piece of the puzzle was missing: something we call 'tone'. The new Washburn Heritage Series HD10S addresses any tonal concerns with a couple of tried and tested timbers. The back and sides are made from mahogany. The top is solid Sitka spruce, a slice of tree that sends a shiver of excitement through any acoustic tonehead - it's like shouting bingo numbers at a group of old ladies. The HD10S also features a dreadnought-sized body, a mahogany neck with a satin finish, white plastic body and neck binding, a rosewood 'board with 20 thin vintage-style frets, and a top nut and bridge saddle fashioned from the aforementioned NuBone. The only other newsworthy items are a set of chrome die-cast machineheads and the fact that the HD10S is the only model in the Heritage Series that's offered in a left-handed format, albeit for an extra 20 quid. 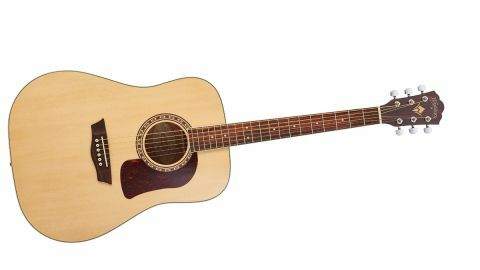 This affordable guitar offers the classic well-spec'd dreadnought performance: bags of volume, a booming bottom end, and a touch of natural compression when you hit the strings hard. The Sitka spruce top is cut thin, which allows it to vibrate freely. More movement equals more volume, and an eventual improvement in tone. Figure in the slim neck profile, and low, buzz-free string action, and you've got a great all-rounder for £249, not that much more outlay than some entry level stopgap.